At the turn of the 20th century, the American Bison, our national mammal, was nearly wiped out by relentless slaughter. Populations plunged from between 30 to 60 million to less than 500 animals. Though tireless efforts to restore herds have helped place bison on the path toward recovery, they still need your help. 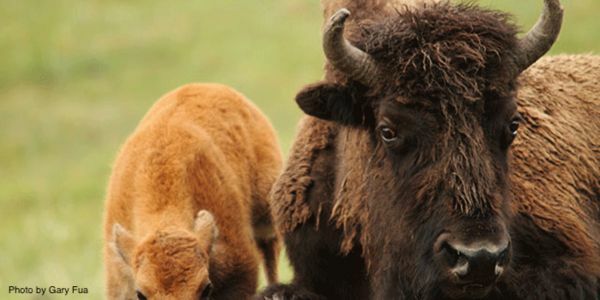 To survive, the American Bison relies on the North American tallgrass prairie -- an ecosystem that is more imperiled than the Amazon rainforest. Congress has the power to protect bison habitat by supporting one of our nation's most effective conservation programs, the Land and Water Conservation Fund (LWCF). However, Congress has now let this program expire -- even though the LWCF doesn't cost taxpayers a dime! Meanwhile, critical bison habitat in the Dakotas, Oklahoma, and throughout the nation get turned into parking lots. The still-fragile bison comeback needs the LWCF. Our prairies need the LWCF. Iconic American species need the LWCF. And Congress needs to hear this message -- from you. Please urge Congress to renew and fully fund the Land and Water Conservation Fund as soon as possible for bison and all of the species that are critical to our natural spaces. The Land and Water Conservation Fund has played a critical role in protecting fragile habitat for America's cherished species for over 50 years. This program -- which doesn't cost US taxpayers a dime -- protects so much about what makes America great and has been crucial for connecting people to nature and our natural resources. But now this program is now expired, undermining long-term conservation planning that can make a real difference to the recovery of vital species. I urge you to renew and fully fund LWCF as soon as possible for all of the species that are critical to our natural spaces.